The Airport Project, as proposed, is a bad deal for Bermuda. First, look at all the facts set out in the Financial Comparison Report and in the most recent hand outs to Parliamentarians on the airport re-development scheme. Then start reading this comment by studying and understanding this chart. More than three hundred years ago, Sir Isaac Newton enunciated the third law of motion, which said that all actions have reactions. Neither Bermuda nor the Minister for Finance acts in a national or international environment where there are no reactions, no consequences, and no impacts for actions taken. That’s the core problem with this Airport/AECON scheme. The unavoidable consequence of proceeding as shown in the Financial Comparison Report and these most recently released reports on the airport re-development scheme is that it creates an immediate as well as a long-term bad reaction, consequence, and impact on all Bermudians now, and for 30 years into the future. It helps cripple the next six administrations in the same way that this administration was crippled by decisions taken between 2004 and 2012 by the previous administration. Overall, it is a bad deal for Bermuda and Bermudians. However, it is a sweetheart deal for that one profit-seeking Canadian corporation – AECON. In the G2G section, one isolated clause alludes to the unstated but never-absent downside risk. “…Sharing of upside revenues above a certain minimum base case level…”. In plain language, that’s the profit-sharing/revenue-sharing scheme that the Minister never fails to mention. But what happens if Airport revenues fall below “a certain minimum base case level”? If revenues fall below the level that guarantees AECON’s minimum walk-away profit, who makes up the dollar difference? Who? Although not stated or referred to anywhere in this unnecessarily complicated array of words, tables, and spreadsheets, there is, and in the real world there always is and always will be, a ’loss scenario’. However, no one has stepped up and honestly described these loss facts. These new reports skate over this. The concealed and unstated fact is that the Bermuda Government will have to reach into its ‘reduced revenue’ pot [reduced by the $27m revenue – see chart] and pay out additional Government money [revenue] to give to AECON so that the Canadians always walk away with at least their guaranteed ‘base case’ profit/revenue. As clearly and simply as possible, the chart shows why this Government is so desperate for Revenue. Increases in Government Revenue are now slower than increases in Nanci [The full Debt Servicing Costs of Interest + Sinking fund = Nanci]. In FY 2016/17, Government hopes to take in $997m. This is $44 million more than eight years ago in 2008 when Government took in $953m. However, in 2016, greedy Nanci is gobbling up $159 million more dollars than he did in 2008 – when Nanci was happy to be fed a mere $28m a year. So, as the chart shows, there was no actual dollar increase in what Government ends up with as spending money in 2016/17. In fact, as the numbers in the chart show – and show very clearly – Government ends up with $115m less money available to spend than it had in 2008. less, not more. But eight years later, in 2016, everything costs a lot more. Relative to 2008, Government’s real ability to spend is 62% lower and Government has fewer dollars to start with – $925m in 2008, but only $810m in 2016. 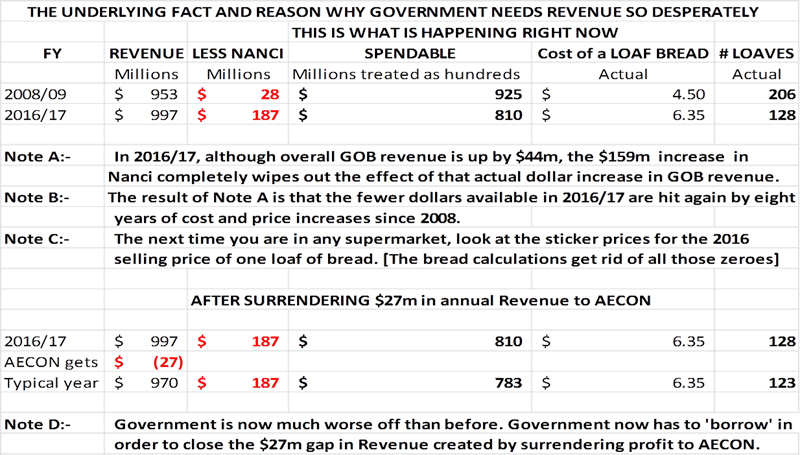 As long as this Government and the machinery of Government carries on with a now thirteen year-long over-spending spree bringing with it a consequential need to borrow, a greedy and growing Nanci will always gobble up any actual dollar increase in Government revenue. Even as you read this, Government is seeking to build up its ‘Revenue’ by borrowing a fresh tranche of $665 million dollars so that Government can continue its thirteen year overspending habit and muddle through to 31st March 2017. Without this $665m borrowing, there would be a Government financial collapse caused by Government having zero dollars with which to continue paying for Personnel + Operations + Capital works. If Government is burrowing [borrowing] into a deeper Debt hole to build up its ‘Revenue’ in order to muddle through to March 31st 2017, then, Government will be burrowing again to get through to March 31st 2018. Then there is March 2019, then March 2020, then March….. In 2008, Nanci was easily satisfied with a relatively paltry $75,707 a day snack. Under this administration, Nanci’s daily feeding cost has gone from $307,713 a day in 2013 to $513,356 a day in 2016. This administration forecasts that it will go to $541,370 a day by 2018. Even as you read this, Nanci demands to be fed a daily three course lunch costing $513,356. This half-a-million-a-day cost for Nanci is the first thing that gets funded every day – 365 days a year. Every minute of every hour of every 24 hours. Nanci’s daily lunch comes out of Revenue. With this Airport scheme’s proposed giveaway of $27m a year, Government is now planning to give away Revenue of about $74,000 every day – for the next thirty years. 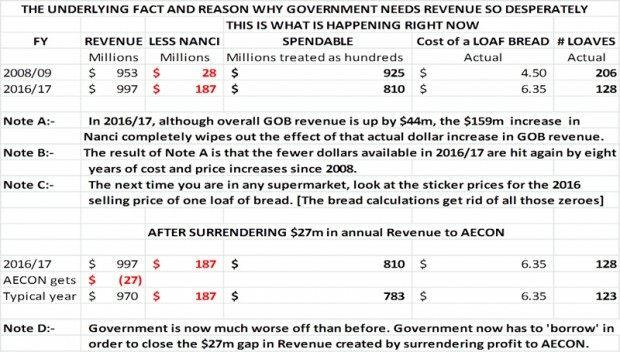 Ultimately, that Revenue giveaway has the same mathematical and accounting consequence as feeding Nanci. This is like feeding Nanci a daily lunch costing $587,000 a day in 2016 and $615,000 a day by 2018. Hors d’oeuvres at $74,000 followed by lunch at $513,356 and rising to $541,370. Government’s own Fiscal Responsibility Panel concurs with the analysis just stated. They say that the surrender of Revenue has the same financial impact as a financial expense. Clearly, very clearly, Government has a chronic Revenue problem. Therefore the very last thing that this Government should be doing is giving away Revenue. It is the very last thing! But this scheme confirms that Government intends to give away Revenue for thirty years. That’s at least $810 million given away [30 years x $27 million a year]. So Government is planning to do exactly the wrong thing – for thirty consecutive years! In Government press releases, when discussing an alternate repair option, AECON suggests: “…GOB would need to borrow $184m to finance urgent repairs and to cover maintenance…”. Will a repair etc… program provide jobs for Bermudians? Of course it will. How many? Over time, 250, 300, 350? That’s way better than AECON’s latest promise which is down to 400 jobs, but with 160 [40%] of those jobs reserved for Canadians meaning only 240 [60%] jobs left over for Bermudians. AECON produced that $184m figure. AECON suggests that it needs to be done in one year. Why? Especially when an AECON new build would take place over three and a half years. Additionally, that AECON $184m assessment is a figure put out by a heavily conflicted business organization intending to paint the worst possible picture, thus making its own proposal look so much sweeter. For AECON or any other intimately involved entity to provide figures for a repair, renovation, and rebuild where necessary operation is a massive conflict of interest. Right now, Government and AECON are the only entities involved. In 1987, thirty years ago, a much smaller Bermuda Airport Terminal building handled as many as 600,000 departures [1.2m passenger throughput] with about 450,000 Air Departing Leisure Tourists as the base [about 41,000 friends/family + Business Visitors]. In 2015, as shown in Government accounts, LF Wade handled 356,000 departures with a 140,000 leisure Tourist Air Arrivals base [356,000 x 2 = 712,000 total passenger throughput]. If Bermuda’s economy and its GDP struggles back up to where it needs to be, then Bermuda can anticipate struggling back up to 500,000 departures [one million throughput]. This aggregate passenger flow would likely consist of about 120,000 resident departures [40% as now] and 380,000 Tourist departures [60% as now]. But that is a tall order. Since 1987, Leisure Tourist Air Arrivals have fallen almost 70%. From about 450,000  to 140,000 . This plan assumes that Air Arriving Leisure Tourism [struggling at 140,000 Air Arrivals in 2015] will quickly double and grow [100%] to 280,000/290,000 Leisure Air Arriving tourists. This plan also projects future Air Arrivals figures suddenly running strongly counter to the existing thirty year decline. In that 2006 report, the people who prepared it projected that by 2020, Leisure Tourist Air Arrivals would exceed 500,000. They were horribly badly wrong. This plan is looking ahead at a Leisure Tourist future that is laden with even more problems than in 2006. Really? Why would ‘passenger traffic’ be higher simply because a private company is operating Bermuda’s passenger Air Terminal? Why? On 31st August 2016, a JetBlue aircraft landed in Cuba. JetBlue’s first scheduled regular commercial flight from the USA is the forerunner of thousands of new flights into the brand new Tourism magnet of Cuba – with millions of Tourists coming from Bermuda’s primary Tourist market, the USA. Currently, Air Arriving Tourists coming to Bermuda must buy $400 a seat flights. Potential Air Arriving Tourists into Bermuda will now have the option of $200 a seat flights into Cuba. Bermuda’s problem of attracting more Air Arriving Tourists has grown even larger. Topping that off, the Minister for Finance Increase the cost of flying into Bermuda. The Minister Increase the cost of every airline ticket by adding $15 to the Airport Departure Tax and tacking on another $6 Airport Improvement Fee. The Minister added a total of $21 to every ticket for every Airport user – including Air Arriving therefore Air departing Tourists. Why did the Minister do that? In order to increase the profits/revenue stream derived from the Airport. What will the Minister do with the increased profits/revenue? The Minister proposes to give all of the increase to AECON for the next thirty years. This proposed Airport scheme is a sweetheart deal for the Canadians who stand to receive a total minimum of $810m from a guaranteed thirty year profit/revenue stream. This proposed Airport scheme is a bad deal for the Bermuda Government who will surrender $810m of desperately needed Revenue in exchange for a $267m AECON built Air Terminal building and, relative to construction work payout, very little national economic stimulus. This Airport Project, as proposed, is a bad deal for Bermuda. Any further movement should be stopped until a full and honest analysis is done. Thank you Larry – and yes, the forecasts on passenger useage are key. An excellent outline of information in regards to this critical # Airportgate Deal. ……..
U.B.P. has been a BAD DEAL. $267m borrowed for 30 years at 6% compound interest would result in total cost of $1.6bn. I would hardly call a 4% return p.a. on a $267m investment a sweetheart deal. Think that’s assuming that there were no interim payments and the entire loan is repaid as a lump sum. There’s a lot of assumptions in Burchall’s article as well. If they made monthly payments on the cost of the airport over 30 yrs the interest alone would be $304000000.00 the same amount of money the government has guaranteed Aecon. What Larry is stating is that the government should not build an airport period. He is also stating that the total current airport profit should be used to repair and upgrade the airport over the next 5 years. He does not go into the state of repair the airport will be in in 5 years and what new investment will be necessary. It is a given that renovations are more expensive than a new build and yield a less satisfactory product, but Larry is stating that Bermuda and Bermudians needs to realize that they are so indebted by previous governments that they have to settle with getting by. What Larry is not saying here, but has in the past, is that government cannot afford the services currently supported and still pay its bills. In essence the government needs to cut back on services and payroll, in other words a period of austerity until the debt has been pared down. Is this what the PLP and union supporters want? Back of a postage stamp type work with a lot of verbiage. It is not a decision based analysis considering alternatives or the deal with status quo and maintenance. I think Larry did a pretty good job on the debt analysis, but this airport analysis is poor. It looks at one facet and frames the project on that one facet. No Larry, the PLP was a bad deal for Bermuda and that’s why we are going down this path. Look, even the PLP agrees that we need a new airport, so the only thing we are debating is who is going to build it and how we’re going to finance it. Make no mistake, I’d rather the OBA build it given the PLP’s track record. Especially after what has come out during this Commission of Inquiry! Did you even read the article or did you just respond to the fire…? Willful ignorance. Where has the unsustainable cost of maintaining the existing airport been included in these calculations? That’s where all the breakdowns fail – they don’t compare the other alternatives and “do nothing” is no longer an alternative. As others have pointed out above the cost of patching up the older one and then building in 10 years is much higher. Thanks Larry, that’s a good summary. What saddens me is how even something that clear will be instantly politicized. From the PLP view: See! Brilliant Burt is right and it’s Bad for Bermuda – the OBA doesn’t care about real Bermudians! Completely ignoring the most salient point, NANCI, which was created at least in part by the Brilliant Burt. From the OBA view: We have to do this because our airport is crap, and the PLP bankrupted us, so this is the only way. As others have noted, the increasing flights assumption is reasonably terrifying when coupled with the revenue guarantee. Unless things change dramatically, that will put us on the hook in the future. But all that said, we probably do need to do SOMETHING with the airport. If we’re truly making $27m pure profit from its operation, than one would assume that could immediately be poured back into renovations/duct tape whatever to keep it ticking over. However, I do wonder given the shortfalls in so many other areas of government if that money is already ear-marked for spend elsewhere, and hence not available. Ie, we actually have $0 with which to fix the current infrastructure. Given your clear and correct view of the impact of debt on our future – as a relatively independent observer what would you do? How can we possibly balance the existing debt payments and at the same time run our country when ‘bread’ costs so much more? There are a couple responses provided here which seem clear. Seems like Bermuda’s always getting the bad end of the stick. Time for this sh*t to stop immediately!! Hold ALL Politicians accountable from past and current administrations. Every action has a reaction? Be more specific next time… GOSH! Yet Minister Richards will call Mr Burchall a number bomber and the OBA diehards will ignore him simply because he isn’t supporting their position. No, it’s because Mr Burchall is wrong. And I’m an expat with no axe to grind. Thoughtful and well explained as always, Mr. Burchall. Larry, What is Bermuda getting in return for the $267 million? A brand new airport. Amortized over 30 years x 7 %, that works out to be about $1,830,000 per month x 12 = $21,960,000 (Approx).I’m still $5,040,000 short of your estimate of $27, million. (Okay , I accept there are other built in cost & profits). The real question is ,” Do we need the new airport built NOW? ” THAT IS A DECISION ONLY FOR THE GOVERNMENT TO MAKE . ” We can make noise, but we just came through 14 years of dis – agreeing with the PLP government. The COI is getting to the root cause for the massive over spending under the PLP . Good or Bad, the decision is the government’s alone . You have yet to comment on the plans for a new airport under the PLP had they won the 2012 election. The estimated cost was at least twice the price of this proposed one under the OBA. But not a word from you and other black commentators. WHY! We need to stop promoting a black/white agenda and get to the truth .Had the PLP won the 2012 election, we would be well on our way towards completing the new L.F. Wade Airport. But not a word from you and many others. Why? Less talk about the price of borrowing money. It’s not free. I hope the OBA is thinking about making you a candidate!!! Are you the same Rodney Smith who comes with a certain amount of baggage after unceremoniously evicting a tenant from one of you’re homes without a order from the Courts. The nerve of you to give advice. The pot calling the kettle black. I also recall you on the talk show host when you ran for the PLP until they kicked you to the side for evicting the tenant. You sound like you have a AX to grind with the former Gov. Dunkley this one is a winner. Make him a candidate. Onion Juice, What’s that smell. I would rather have a good debate over the issues. People call names when they run out of words. Why are we in Bermuda not willing to look at all sides of an issue ? It’s either black/ white or PLP/OBA. There is never a middle ground on anything. Why is that? Larry , and many others , think this is a bad deal . Bob , and many others , think this is a good deal . So , who’s right ? It’s a better deal than a debt financed Govt. project that would more than likely to at least 20% over budget to begin with. If the mark up was like Port Royal it would exceed $1bn! Doesn’t matter if it’s a good deal or not. The real question is whether or not there is a better one out there. There aren’t a lot of options. You’re forgetting about the why? Why does one political party think it’s good? Why does one political party think it’s bad? If only there was this much attention paid to Government projects in the period 2004 – 2012 Bermuda would not be in the financial mess it is now. The COI has laid open the “friends and family” cookie jar, the bent rules and the open frauds all limited to a few within the PLP hierarchy clique. Help black businesses? Is Correia Construction or Island Construction black owned? Turning to the airport project, it will never be acceptable to all, nor a financial utopia. Today Bermuda pays over $150 million dollars annually to overseas banks and institutions just on interest on the debt locally incurred. Nothing to do with the worldwide recession so beloved by the PLP as the cause. It has crippled Bermuda. No one has yet been able to provide an independent assessment of the costs and the savings. Even Larry has ignored the on going costs associated with the existing structure. Does the loss of $27 million revenue take into account the expenses that CCC/Aecon will take on that reduces the costs presently paid by Bermuda? There has been sufficient independent oversight that has not said do not proceed. Wow, they pulled this sour pint of milk out for comment? Fact is, Bermuda is in a bad way due to 14 years of PLP. The downward trend looks like the new normal. Burchall ignores that repairing the airport is an expensive bandaid. We get the expensive bandaid and still need a new airport. That’s just a bad and more expensive decision. Burchall also ignores the off the balance sheet approach. Run the numbers with an on the books cost. NANCI looking far, far worse. Larry mentioned Cuba and the competition it will bring. Millions of tourists from the USA, Bermuda’s market. However. it was announced today (1 December) that American Airlines, a rather significant worldwide carrier, is already cutting its flights from the USA to Cuba due to lack of demand. Already and they have only just started. It doesn’t sound like millions going to Cuba. Who can blame them – no ATM’s, use of credit cards or internet for some reasons. Thank you Larry. There is a shallowness to a lot of Bob Richard’s agenda that in the longer term is setting Bermudians back. A close examination of his lack of use of sections 133/134 of the companies act bears scrutiny. The bottom line is he is letting some vile types (understatement) in to our country so he can pretend progress is being made. Pretty obvious Mr., Burchall is a plp supporter. They could’ve certainly used him for all those overruns. Where was he then.